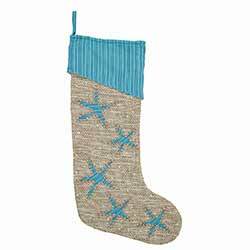 A fun and beachy way to dress the mantle for Christmas morning, the Nerine Stocking is a textured natural cotton jute with appliquéd starfish in ocean blue striped seersucke. 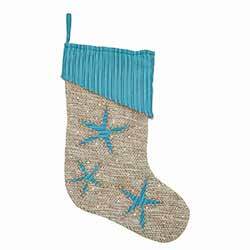 A fun and beachy way to dress the mantle for Christmas morning, the Nerine Long Stocking is a textured natural cotton jute with appliquéd starfish in ocean blue striped seersucker. 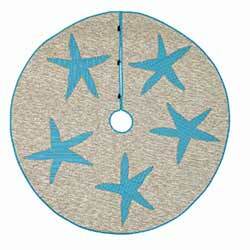 Tastefully adorned by starfish, the Nerine 48 inch Tree Skirt is a fun addition to the beach Christmas look. 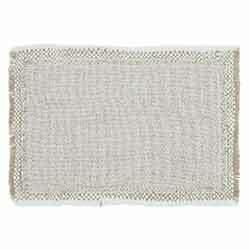 Features textured natural cotton jute. 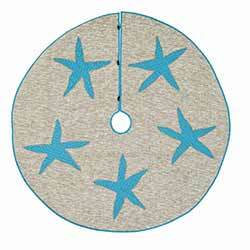 Tastefully adorned by starfish, the Nerine 55 inch Tree Skirt is a fun addition to the beach Christmas look. Features textured natural cotton jute. 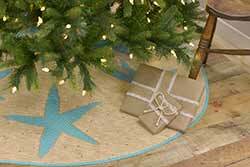 Tastefully adorned by starfish, the Nerine 60 inch Tree Skirt is a fun addition to the beach Christmas look. 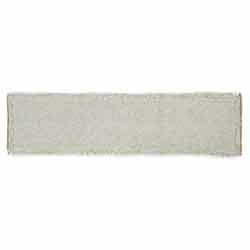 Features textured natural cotton jute. 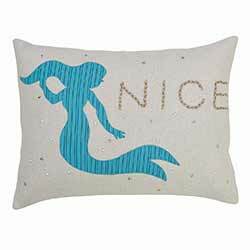 A coastal take on a familiar holiday saying, the filled Nerine Mermaid Pillow is a tribute to Christmas on the beach. 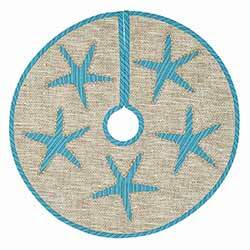 Features a textured natural shade cotton jute with appliquéd starfish on a ocean blue striped seersucker and accented with natural braided rope, pearl and star studs. >Bringing the holidays and the water together in a fun way, the Nerine Seas & Greetings Set of 3 take a play-on-words and make it memorable. 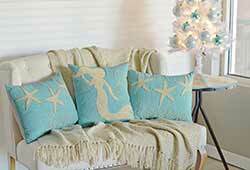 A coastal take on a familiar holiday saying, the filled Nerine Shark Pillow is a tribute to Christmas on the beach! Features creme felt with an appliquéd shark in ocean blue seersucker striped cotton. 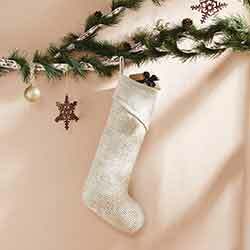 The Neve 20 inch Stocking graces the mantel with a creme and shimmering presence from its woven beige and pearl acrylic fabric. 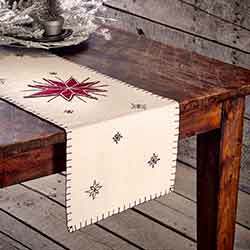 The Neve 48 inch Table Runner showcases a modern vintage design that strikes a balance between grace and ruggedness. Neve weaves creme burlap with silver metallic thread for a shimmery finish. Reverses to beige and pearl acrylic. 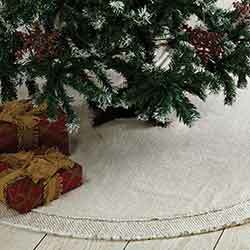 The Neve 48 inch Tree Skirt graces the tree with a light and bright presence with its woven beige and pearl acrylic fabrics. The Neve 72 inch Table Runner showcases a modern vintage design that strikes a balance between grace and ruggedness. 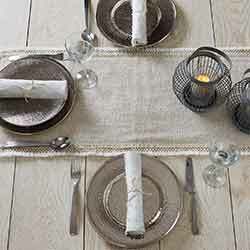 Neve weaves creme burlap with silver metallic thread for a shimmery finish. Reverses to beige and pearl acrylic. The Neve 90 inch Table Runner showcases a modern vintage design that strikes a balance between grace and ruggedness. Neve weaves creme burlap with silver metallic thread for a shimmery finish. Reverses to beige and pearl acrylic. 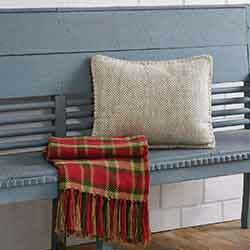 Give your home a Farmhouse glisten with the 14x18 Neve Acrylic Filled Pillow! Neve makes the room sparkle with winter cheer and country charm. 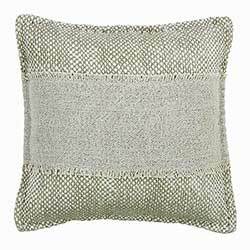 Neve Creme Decorative Pillow, by VHC Brands. Features woven beige and pearl fabric for a versatile neutral look that add warmth and texture to most home decor styles! The Neve Placemat Set graces the dinner table with a light and bright presence with its woven beige and pearl acrylic fabrics. 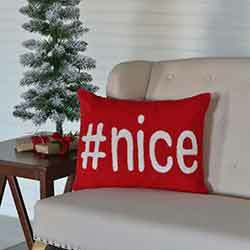 A fun and modern take on a timeless message, the filled #Nice Pillow 14x18 is a textured hand-hooked barn red with #nice embroidered in snow white. The Nicholas Chenille Jacquard Woven Throw exudes a luxury and charm that's perfect for the holidays or any time of the year. Ninepatch Star Quilt, by Victorian Heart. 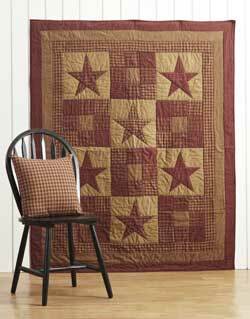 Ninepatch Star is a beautiful and classic primitive pattern of burgundy, beige, and tan plaid fabrics pieced in a patchwork of squares and stars. This is for the KING sized quilt. Measures 105 x 95 inches. 100% Cotton. Machine washable (see label for care instructions). Other matching accessories also available! Ninepatch Star Quilt, by Victorian Heart. 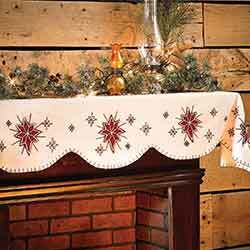 Ninepatch Star is a beautiful and classic primitive pattern of burgundy, beige, and tan plaid fabrics pieced in a patchwork of squares and stars. This is for the LUXURY KING sized quilt. Measures 120 x 105 inches. 100% Cotton. Machine washable (see label for care instructions). Other matching accessories also available! Ninepatch Star Quilt, by Victorian Heart. 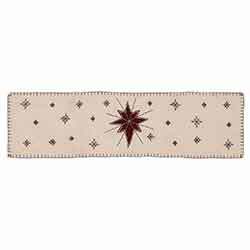 Ninepatch Star is a beautiful and classic primitive pattern of burgundy, beige, and tan plaid fabrics pieced in a patchwork of squares and stars. This is for the QUEEN sized quilt. Measures 90 X 90 inches. 100% Cotton. Machine washable (see label for care instructions). Other matching accessories also available! Ninepatch Star Throw, by Victorian Heart. Ninepatch Star is a beautiful and classic primitive pattern of burgundy, beige, and tan plaid fabrics pieced in a patchwork of squares and stars. This is for the Throw sized quilt. Measures 50 x 60 inches. 100% Cotton. Machine washable (see label for care instructions). Other matching accessories also available! 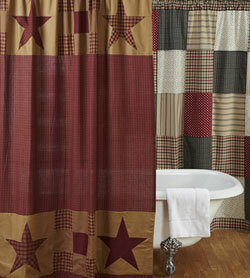 Ninepatch Star Shower Curtain, by VHC Brands. 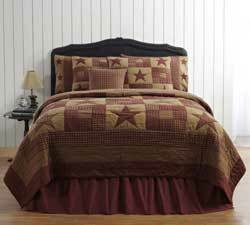 Features a palette of burgundy red and tan, with patchwork strips along the top and bottom. Measures 72 x 72 inches, with button holes for your shower hooks above a 3 inch rod pocket. 100% cotton. Unlined, except for the patchwork strips (that part is lined). 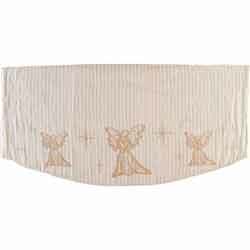 Gold metallic holiday angels among shining stars look over the mantel in the Noel Nostalgia Shelf Runner. 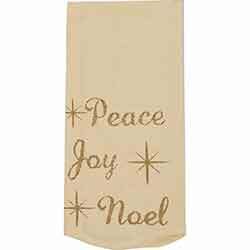 Noel Nostalgia Tea Towel Peace Set reminds us all of what the spirit of Christmas brings. 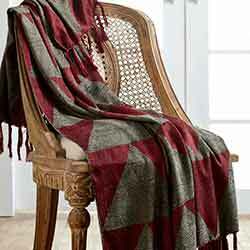 If youre a fan of Scandinavian poinsettias, you will love the Nordic Nice Woven Throw 60x50. Beautifully showcasing repeating, diagonal Scandinavian poinsettias and polka dots stenciled in red on a silver woven background. 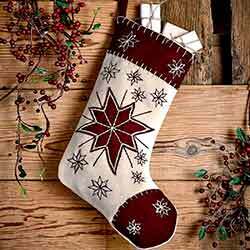 Inspired by the symbolism and significance of the brightest star in the sky, we created the North Star 15 inch Stocking. 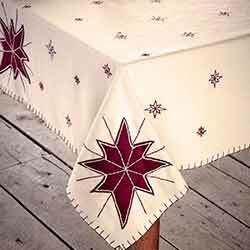 Inspired by the symbolism and significance of the brightest star in the sky, we created the North Star 48 inch Table Runner. Inspired by the symbolism and significance of the brightest star in the sky, we created the North Star Mantel Scarf. 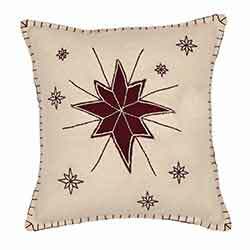 Inspired by the symbolism and significance of the brightest star in the sky, we created the 10x10 North Star Filled Pillow. 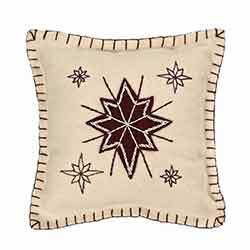 Inspired by the symbolism and significance of the brightest star in the sky, we created the 16x16 North Star Filled Pillow.It is the details of intricate embroidery and thick whip-stitching that give North Star a rustic primitive look. 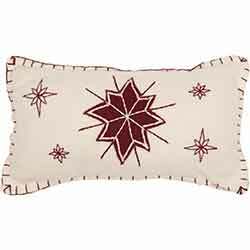 Inspired by the symbolism and significance of the brightest star in the sky, we created the 7x13 North Star Filled Pillow. Inspired by the symbolism and significance of the brightest star in the sky, we created the North Star Placemat Set. Inspired by the symbolism and significance of the brightest star in the sky, we created the North Star Tablemat Set. 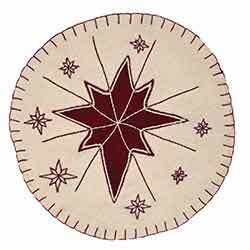 Inspired by the symbolism and significance of the brightest star in the sky, we created the North Star Table Topper 40x40. 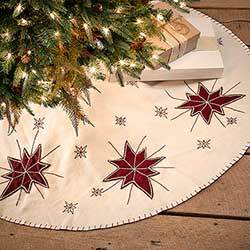 North Star Tree Skirt, by VHC Brands. 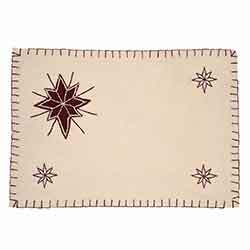 Creme felt base fabrc, with winking stars surrounding applique red felt north stars with hand embroidery. Burgundy whip stitch detail. 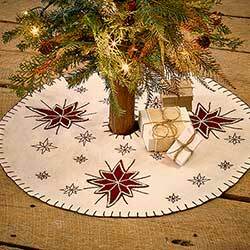 North Star Mini Tree Skirt, by VHC Brands. Creme felt base fabrc, with winking stars surrounding applique red felt north stars with hand embroidery. burgundy whip stitch detail.